Judging by the Cover – 4/10/19 new releases – AiPT! Forrest and Eric share their favorite covers from the week’s new comics. In that spirit, here are the covers that captured comics podcast co-host and contributor Forrest Hollingsworth and Manga Editor Eric Cline’s attention this week. 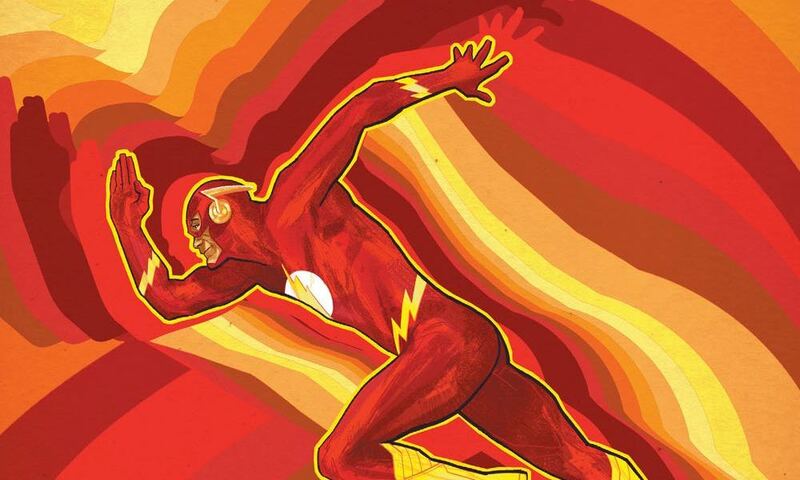 Most Flash covers are focused on conveying the character’s speed by having him move blindingly fast past stationary objects, tearing up streets as he goes, cloaked in lightning, etc. Gerads takes an entirely different, significantly more restrained and iconographic approach here that I think works incredibly well instead. Evocative of ’60s and ’70s aesthetics while also conveying a great deal of fluidity and motion simply, this cover is all trademark Flash in a different, refined way. I don’t just think it’s one of the best covers this week, I think it’s one of the best covers this month. Easy jokes about keeping your eyes on your head being important for a character named The Vision notwithstanding, this is a really expressive and explosive cover. Similar to the Flash cover above, it relies on the simple visual motifs of a character many comics (and film) fans are familiar with exaggerated in an engaging way and it makes me all the more curious what’s going on in No Road Home. It’s violent but not exploitative, kinetic but not overbearing, intriguing and inviting as the cracks carry from small at the bottom of the image to egregious at the top. The fact that it syncs up with Vision’s death in the MCU is more than likely coincidental but it definitely benefits from that anyways, too. I love covers that are in keeping with the trappings of the genre or time their narrative is reliant on, and this is a great example. Reminiscent of Japanese woodblock prints of yokai, or ghosts and demons, Young does a good job of creating a simple scene or snapshot dripping in tone and atmosphere. Dread, pain, maybe even a little malice – it’s all here, but it’s employed within the framework of what’s within the comic as well, and that’s the kind of thing that draws readers in and keeps them in because it’s honest and effective. This cover makes the demented fun. What more bizarre way to incapacitate a villain than to trap them in a fish tank? Red Hood’s casual posture just makes the image all the more amusing. The line-work is nice and flowy as well, especially where the bubbles and the plants are concerned. The bright colors of the tank and desk pop well against all the darker blacks in the middle of the image too. I love the colors here. Orange and white contrast against each other really well, and the gradient of oranges is especially nice to look at. I also dig how Tocchini manages to make the figure look like they’re either submerged or floating backward just through the angle and some undefined specks of color in the background. There’s a nice abstractness to the image that’s well-thought-out while still maintaining a pleasantly simple overall look. Really great work. I really dig this. Hughes makes great use of motion blurs to convey just how inhumanly fast Superman is. The way he’s holding onto the train behind him looks downright effortless. The details in the billowing of his cape and the splashing water droplets are also great. It’s touches like these that really help put the character’s tremendous power in perspective; he’s the ultimate archetypal superhero for a reason.